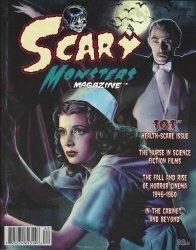 This is the Health-Scare Issue #101 of Scary Monsters magazine! ... and the usual regular features! Full color cover and vintage B&W content. 112 pages. Editor in Chief: Don A. Smeraldi. Art Director: Vicki Smeraldi. Collectors Note: If you want your issue bagged and boarded click on the drop-down menu above to select this extra service.